Blog post by Gustavo Cano about Javier Beristain Iturbide: Immigration Now: ¡Oye tú Beristain! 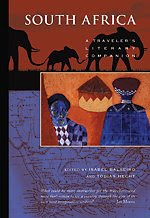 New from Whereabouts Press, a book for travelers who want insights more profound than a mere guidebook can provide: South Africa: A Traveler's Literary Companion edited by Isabel Balseiro and Tobias Hecht. As an avid reader of international fiction and as a fellow Whereabouts Press anthologist (mine is Mexico: A Traveler's Literary Companion) I am so delighted to see this excellent new addition to the series (and with such a gorgeous cover!). A couple of the authors, Nadine Gordimer and J.M. Coatzee, are familiar names, but the majority are new to me and I am sure, most American readers. The section under "Gauteng" includes works by Ivan Vladislavic, Es'kia Mphahlele, Ahmed Essop and Zacharia Rapola; "Kwazulu-Natal" includes Alan Paton, Ronnie Govender, and Lewis Kkosi; "The Western Cape", Jan Rabie, Richard Rive, J.M. Coatzee,Rustrum Kozain; and finally, "The Rural Areas, the Farm, and the Game Park" includes A.C. Jordan, Oliver Schreiner, H.C. Bosman, Gcina Mhlope, Modike Dikobe, and Nadine Gordimer. 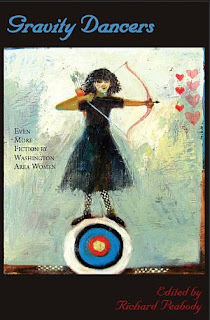 The cover's painting is "Repositioning II" by Bongi Bengo 2009). More anon. 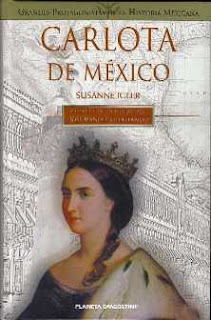 "This book does not attempt to rewrite the complete history of Mexico's Second Empire, but it does aim to fill several gaps in Mexican historiography by bringing forth accounts translated from the German, which because of the language barrier, have not been considered in Mexico. These are not only memoirs and diaries of the period, but also recent monographs, both published and unpublished, in German. ... [In addition to these contributions by Professor Wandruska and his group of researchers, this work] covers the unpublished memoirs of the gardener and botanist Wilhelm Knechtl; the diary of Johann Stefan, first engineer on the Novara; published works on the Austrian Volunteer Corps by Edmund Daniek and on the Mexican Austrian Volunteer Corps by Felix Gamillscheg; the research by Norbert Stein on Father Fischer; a brief but essential and richly detailed work by Johann Lubienski on government institutions under Maximilian, and Felix Wilcek's thesis on Maximilian's income and expenditures in Austria.... [And] in a final chapter I have added a biographical sketch of Egon Cesar Corti, biographer of Maximilian and several other European sovereigns and dignitaries. Unfortunately, given the lack of biographical information and misunderstandings with the University of Vienna, which never offered him a professorship, the 50th anniversary of his death in 1953 went unnoticed in Mexico as well as his native country." 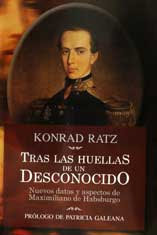 "...Konrad Ratz's work has great value for Mexican as well as Austrian and European historiographies on the Second Empire. He brings us new details and in such clear prose with short chapters that we may read it as a novel, though it is based on solid foundations thanks to meticulous historical research.... we discover the weaknesses and strengths of Maximilian, the romatic politician who dreamed of being the new Quetzatcoatl, Mexico's savior." Tras las huellas de un desconocido has my highest and most enthusiastic recommendation. Indeed, no bibliography of Maximilian and the Second Empire would be complete without it. I'll be posting a note about some of Dr. Ratz's other works anon. P.S. Yes, I was able to incorporate some of this new information into my novel, The Last Prince of the Mexican Empire. In particular, it helped bring into a sharper focus that shadowy arch-conservative intriguer, Father Fischer; Maximilian's education; and Maximilian's relationship with Count Bombelles. It's Cinco de Mayo in July (¿porqué no?) 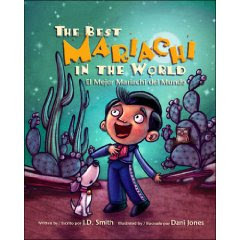 and apropos of his beautiful and award-winning new bilingual children's book, The Best Mariachi in the World / El mejor mariachi del mundo, poet J.D. Smith is guest-blogging with his top 5 mariachi links. Over to you, J.D.! 1. There are at least 20 annual mariachi festivals in the United States. The largest is the San Antonio Mariachi Festival, which includes students, professionals and music educators from the Southwestern United States and Mexico. The Festival’s site also links to other resources and a message board. 2. A headliner at several mariachi festivals and an essential part of the music’s history is the original Best Mariachi in the World, Mariachi Vargas de Tecalitlán. Established in 1897, this group both maintains and carries forward the tradition. 3. While mariachi began as a male-dominated genre, women in both mixed and all-female groups have become increasingly important. Mariachi Queen Laura Sobrino, who played at the Opening Ceremonies of the Beijing Olympics, provides an overview in the February 2009 newsletter of the National Association for Music Education. 4. In some rinconcito of your heart, you know that at least once in your life you want to dress up as a mariachi. You can find examples of traditional clothing and learn some of the terminology at Mariachi Connection. 5. One article can hardly cover the whole subject, but there’s a morsel on cocina mariachi in Issue #25 of Saveur. ---> For the archive of Madam Mayo guest-blogs posts, click here. Largehearted Boy (apropos of The Last Prince of the Mexican Empire). *The Haul That Helps Small Farms by Emma Brown, Washington Post. *To view the video that accompanies this story, click here. *Michael Pollan, author of In Defense of Food and The Omivore's Dilemma. Viva Richard! Richard Peabody's latest anthology of Washington DC women writers, Gravity Dancers, has just been published and was launched with a standing-room only reading / celebration at Politics & Prose last Sunday. Check out the fiction by Maud Casey, Dylan Landis, Katharine Davis, Helen Hooper, Elisavietta Ritchie, Lynn Stearns, Paula Whyman, Laura Zam, and many more. And is this not a bulls-eye of a cover? The painting is by Sheep Jones; book design by Nita Congress. P.S. You can read "Manta Ray," my short story from Grace and Gravity, in its entirety here. You must sell 100,000 copies in one week to break into national best-seller lists. Panelists agreed on a number: 75% of projects they represent get sold (eventually). Blog by Chuck Sambuchino was mentioned approvingly, "Guide to Literary Agents"
A self-published book must sell 5,000 copies to get an agent's attention, panelists agree. * For major publishers, 20-30,000 copies is a viable hardcover project; for university presses, 15,000 copies. * Big sales of your first book are crucial for your subsequent career as an author. * "Literature is an endless source of courage and confirmation"
* Be stubborn, persistent; "take no for an answer with dignity and grace"
* Poem: "Expect everything, and anything is nothing/Expect nothing, and anything is everything"
* "In the end, nobody in the publishing business knows how to do this, especially in fiction"
* "Remember how and why you are a storyteller"
P.S. I also posted some notes about the "Other Times, Other Places" AIW conference panel I moderated with novelists Wayne Karlin, Olga Grushin, and Frederick Reuss. More anon. Here's what's next: two talks in Washington, D.C. about the story behind the very Washingtonian story of The Last Prince of the Mexican Empire, and why it has been obscured for more than 130 years. Who knew that Mexico once had a half-American prince? Or that this little boy’s future was hotly debated not just in Mexico but in Washington D.C. and in every court in Europe? Set in the mid-19th century when Maximilian von Habsburg was Emperor of Mexico, The Last Prince of the Mexican Empire is based on the true and never before completely told story about a half-American boy who, as in a fairytale, became the heir presumptive to the throne of Mexico and then, when his American mother wanted him back, a pawn in the struggle-to-the-death over Mexico's destiny. This novel incorporates original research into what is also a very Washingtonian story, for the prince's mother, née Alice Green, was from a prominent Washington family, and his father, Angel de Iturbide, second son of Mexico's first deposed emperor, Agustín de Iturbide, had come to Washington as a young boy and eventually served as the Mexican legation's secretary. Photographs, excerpts and more can be found at www.cmmayo.com. This Tuesday evening (July 14, 2009) at 8 p.m. CST I'll be doing the Nuestra Palabra: Latino Writers Having Their Say radio show with Liana Lopez and Tony Diaz, talking about my new novel based on the true story, The Last Prince of the Mexican Empire. ...we’re now accepting submissions for our 17th volume of the Two Lines anthology of literature in translation...The 17th volume will be edited by Natasha Wimmer and award-winning poet Jeffrey Yang and submissions are open through November 25, 2009. For further details, see the Center’s website, www.catranslation.org. How time zooms. I've been meaning to post something about the panel, "Other Places, Other Times: The Special Challenges of Writing and Publishing Historical and International Fiction," which I moderated (and participated on) at the American Independent Writers Conference in Washington DC last month. The other three panelists were novelists Olga Grushin, Wayne Karlin and Frederick Reuss. These three are not only among the most outstanding writers in the Washington DC area, but the entire country, so it was a priviledge indeed to hear them speak. 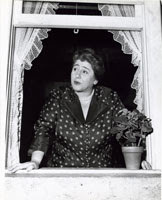 Olga Grushin. The Russian-born author of The Dream Life of Sukhanov, a first novel that garnered scads of rave reviews, grew up in a radically different mileu than most American writers: in Moscow and Prague and surrounded by artists. In the panel, Grushin spoke of the challenges of not only imagining the point of view of a middle-aged man, but writing in English, which is her second language. She said, "I often find myself thinking of a saying of Charlemagne: 'to know another language is to have a second soul.'" One thing she said that especially intrigued me: "I don't let myself near contemporary fiction when I am writing." Check out Olga Grushin's bio and her fascinating interview with Library Journal. "In this tragically forgetful country, this country whose own history--- even the history told by the winners and the public figures--- is mostly lost, it has fallen to its best novelists to tell the whole, real story, and to make it indelible. Thatis the province of Truth, finally--- Truth, the old, abused word, one Pontius Pilate had so much trouble with--- and it is what divides all the writers worth reading from those who are not worth reading. Wayne Karlin is one of the truth-tellers. You read him and your spirit is enlarged, and you want immediately to re-read him, for savoring. Line by line, he is lyrical, precise, deeply insightful, and breathtakingly vivid. he has long been among the best writers we have in this country--- in fact, I believe he is among the best writers we have ever had. And this amazing book is moving, utterly involving, and finally unforgettable." In the panel Karlin talked about the nature of the novel, how it is "a mirror we holdup to ourselves." He went on: "writers, even when they are creating situations of the utmost fanstasy mine their lives for what they've learned, what they've experienced... I believe as Conrad did, that a writer's main job is to give the reader surrogate experiences." Indeed: "a vivid dream," to use John Gardner's term. Or a "virtual reality." Read an excerpt from The Wished-For Country here. Karlin is also the author several other novels, including Marble Mountain and Prisoners. He is also a translator of Vietnamese and has edited anthologies of Vietnamese writing, and his latest book, a work of nonfiction forthcoming in September 2009, is Wandering Souls, about an American soldier who, long after the war, returns to Vietnam. In the panel Reuss said, "Paradoxically, I feel that in creating Max and Käthe and Eva Mohr as fictional characters, I have come to know them more intimately that if I had stuck to facts." Read this profile of Reuss and Mohr in the Washington Post; Colleen Mondor's review in Bookslut; and about his earlier novels, Henry of Atlantic City, Horace Afoot, and The Wasties, here. BETHESDA, MD (July 8, 2009)—The Writer’s Center announces the formation of a new initiative: the Undiscovered Voices Fellowship. Because The Writer’s Center believes writers of all backgrounds and experiences should have an opportunity to devote time and energy toward the perfection of their craft, we are accepting applications from promising writers earning less than $25,000 annually to apply for our Undiscovered Voices Fellowship. This fellowship program will provide complimentary writing workshops to the selected applicant for a period of one year, but not to exceed 8 workshops in that year. We expect the selected fellow will use the year to make progress toward a completed manuscript of publishable work. The Writer’s Center, a 501(c) 3 established in 1976, is one of the nation’s oldest and largest independent literary centers. We provide over 60 free public events and more than 200 writing workshops each year, sell one of the largest selections of literary magazines in our on-site bookstore, and publish Poet Lore, America’s oldest continually published poetry journal. The Writer's Center is supported in part by The Arts and Humanities Council of Montgomery County, and by a grant from the Maryland State Arts Council, an agency funded by the State of Maryland and the National Endowment for the Arts. The work is amply illustrated with reproductions of portraits (including a charming one of Carlota as an toddler by Winterhalther), and photographs, and includes a chronology and bibliography. This is an important addition to any collection on the Second Empire. P.S. A bibliography for The Last Prince of the Mexican Empire, my novel about the Second Empire, is here. One of the books that has most influenced my writing, and in particular, my ideas about narrative structure, is Michael Talbot's The Holographic Universe. When I came upon it a few years ago, I was already a fan of Canadian novelist Douglas Glover and his notion of the story as net. In other words, even without the scaffolding of a formal plot (ye olde Fichtean curve), a net of images can cohere and indeed so powerfully resonate in the reader's mind that the net is the story. A satisfying story. It was directly--- literally, less than an hour--- after reading Glover's essays on the story as net and the novel as poem (now collected in Notes Home from a Prodigal Son) that I sat down wrote the one that became the title story for my first collection, Sky Over El Nido. In this story the images, woven throughout, have to do with flight: birds, nests, eggs, airplanes. What's the "plot"? A fistful of air. Later, before beginning to write my novel, The Last Prince of the Mexican Empire, I happened upon Talbot's The Holographic Universe, an elegantly lucid and very accessible overview of some of the (then) most cutting-edge theories in quantum physics and in particular, those of David Bohm. If the universe itself is a hologram, or has holographic characteristics, then this could explain why nets of images--- the suggestion of the whole in each of its parts--- can resonate with such strange power in a reader's mind. Does my novel have that power? You decide. But one of the several paradigms I worked with while writing it was, again, the story as a net and, to borrow the title of one of Douglas Glover's essays, "The Novel As Poem." Yes, The Last Prince of the Mexican Empire is a poem. And the main character is not a person but an idea--- the prince as living symbol of the future of the empire. Where does such an idea live? In many minds--- ergo, the novel has a crowd of characters, indeed, a net of characters, woven in among each other's minds and actions. Just of few of the fleeting and repeating images: the Totonac bowl, Egypt, birds, sweets, twilights, composers, asparagus. Last night, I happened upon this video of pychologist Jeffrey Mishlove's interview with Talbot. It's well worth watching in its entirety. Sad to say, Talbot died of leukemia in 1992. Debra Eckerling's interview with me about The Last Prince of the Mexican Empire and the writing process in general has just been posted at Write On! Online. More anon. For anyone (especially but not necessarily) in the Washington DC area who is serious about their writing, whether it be fiction, speechwriting, journalism, or freelancing of all stripes, here's a great offer: If you join American Independent Writers (previously Washington Independent Writers) in July or August, they'll waive the $45 initiation fee. I've been a member for several years now and highly recommend it. Read more about AIW and its many benefits here. P.S. I'll be speaking at AIW's July 16 "PubSpeak" about The Last Prince of the Mexican Empire. And ASAP, I'll be posting something here on this blog about the AIW conference in June, and the amazing panel I moderated, which featured novelists Frederick Reuss, Wayne Karlin, and Olga Grushin. Save the date: I'll be offering a new workshop, a one day only "Dialogue Intensive" at the Bethesda MD Writers Center this September 27 from 1- 4 pm. The link to register should be on-line shortly. One of the most powerfully vivid ways to show character, relationship, conflict and/or mood is through the use of dialogue. For both beginning and advanced nonfiction writers, this workshop focuses on the use and misuse of dialogue, with a series of mini-lectures interspersed with brief exercises. The goal is that by the end of the workshop, your dialogue will be of notably higher quality. C.M. Mayo is the author of the novel The Last Prince of the Mexican Empire (Unbridled Books); Miraculous Air: Journey of a Thousand Miles through Baja California, the Other Mexico (Milkweed Editions), and Sky Over El Nido (University of Georgia Press), which won the Flannery O'Connor Award for Short Fiction. For more about C.M. Mayo and her work, visit www.cmmayo.com. New ongoing project: click here to read. UPDATE October 15, 2011: Spiritist Manual, my translation of Francisco I. Madero's secret book, will be published in November 2011 as an e-book by Dancing Chiva. Visit the book's website, which incudes a biographical note on Francisco I. Madero, Q & A, and resources for researchers. Kathmann has recently published a most unusual book for tweens, teens and, as she puts it, "imaginative adults": A Forest of Mathematics/Un bosque de matemáticas. In this novel / math book, with illustrations by Fabian Nanni, animal characters in a forest present negative numbers, Cartesian coordinates, exponents, fractions, decimals and percents through "real-life" (of the forest) situations, worksheets included, and a young dragon whose wrongdoings are redeemed through math. Apropos of its publication, I asked Lucina to contribute five relevant links. Over to you, Lucina! Hello Madam Mayo and Madam Mayo readers. Here are some recommended websites that come from my recent history. A Forest of Mathematics is a math book. It has a lot of special requirements, in particular in representing fractions and decimals. When I got to long division I was really stumped. How do you write say, 55 divided by 22? I finally had to learn to use an equation toolbar. If you don't have one and need one, I think this will help you. The family of my editor in Argentina protested because they use commas instead of periods for decimal points. My kids in Mexico said they used periods. I investigated and found sites supporting both conventions, but I think the movement of history in Latin American mathematics is toward periods. I sent some website citations supporting my decision. Here is one. Chiron Books has republished my bilingual story book Payshapes and the Bear, originally published in 2000 in Salta, Argentina, copies unavailable for years. The book has new stories and Spanish/English text on facing pages, better for language teaching. Chiron publishers Wim Coleman and Pat Perrin have recently won two prizes for their own children's novel Anna's World. Their website is spectacular and I know they have more technical feats in mind, so I recommend following their doings. Chiron Books is already on the job with online distribution for Payshapes and the Bear, but my publisher for A Forest of Mathematics, Biblioteca de Textos Universitarios of the Catholic University of Salta, Argentina, does not have any way to distribute books. So I have gone through the rigamarole to put A Forest of Mathematics on Amazon.com myself. Pat Perrin from Chiron Books told me how. Here's where you start.